The Philadelphia Outrigger Canoe Club’s Hoe Wa’a Challenge is one of the few East Coast Outrigger Racing Association’s OC-1/OC-2/OC-6-point series races including surfski and standup paddle-board races in open ocean with an inlet beach launch. The OC-6 race site is located at the Brigantine Inlet Beach with a race start in the Absecon inlet into the great Atlantic Ocean along the beautiful Brigantine Beach Shoreline. The first POCC Hoe Wa’a OC-6 race was held September 29, 2012 from Atlantic City, NJ which hosted the OC-6 race for the first four years. A new partnership was forged with Brigantine, NJ as the new host town for our 5th Annual Hoe Wa’a in 2016. 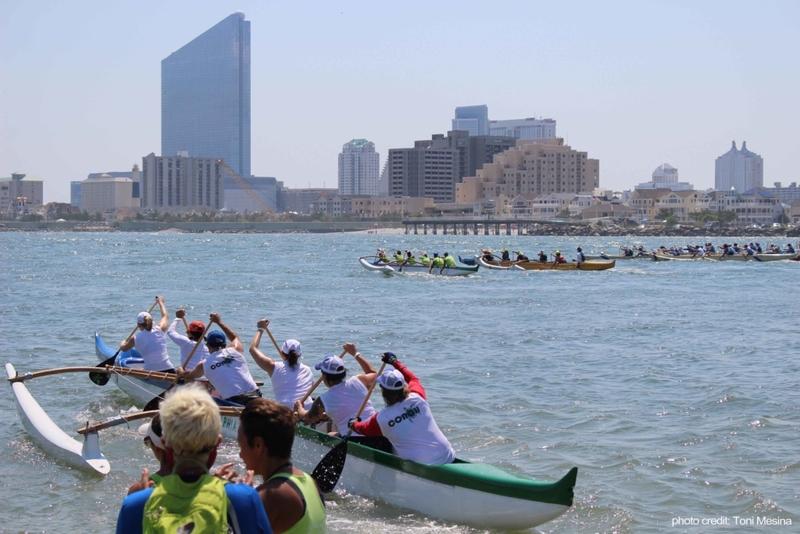 Brigantine, a lively summer beach town, is the perfect backdrop for this event with an inlet beach which worked wonderfully for the launching of canoes as well as being amidst all of the lively summer water sports and friendly dolphins. Afterwards, a post-race luau and awards ceremony is held at the Laguna Grill & Rum Bar on Brigantine Beach which features delicious eats and music. For the last 6 years the POCC Hoe Wa`a focused on OC-6 races. New in 2018 at our 7th Annual Hoe Wa`a Challenge is the expansion into a paddling filled weekend including an afternoon of paddling clinics with world-renowned instructors and a second exciting day of racing for OC-1, OC-2, surfski and paddleboard (stand-up and prone). Teams from up and down the East Coast have raced in the Hoe Wa`a Challenge with teams coming from as far as Washington DC, Chicago and Canada as well as paddlers from Hawaii and Argentina. With the highest number of crews racing last year, we look forward to more paddlers coming to participate in our epic open-ocean hoe wa`a.